Join us on Wednesday, 23rd January from 6:30pm onwards at Bookazine Prince’s Building for the 8th edition of our “Meet the Authors” event to celebrate the past, the present and the future! 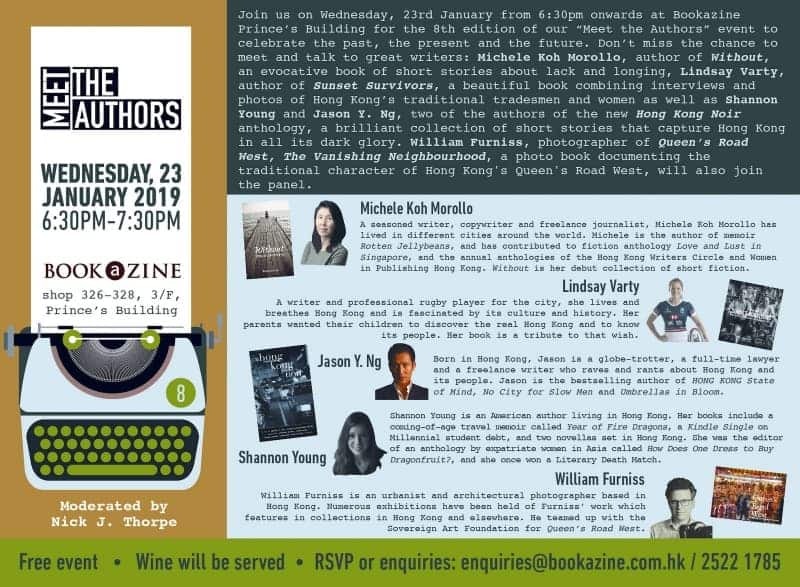 Don’t miss the chance to meet and talk to great writers: Michele Koh Morollo, author of Without, an evocative book of short stories about lack and longing, Lindsay Varty, author of Sunset Survivors, a beautiful book combining interviews and photos of Hong Kong’s traditional tradesmen and women, as well as Shannon Young and Jason Y. Ng, two of the authors of the new Hong Kong Noir anthology, a brilliant collection of short stories that capture Hong Kong in all its dark glory. 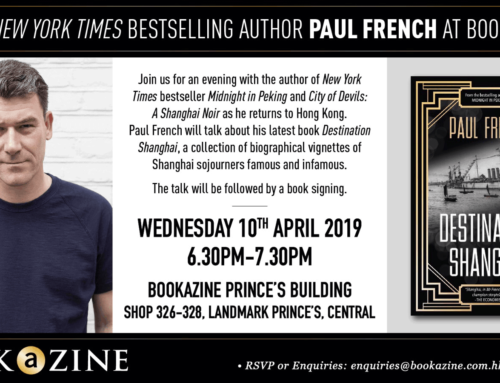 William Furniss, photographer of Queen’s Road West, The Vanishing Neighbourhood, a photo book documenting the traditional character of Hong Kong’s Queen’s Road West, will also join the panel. The event will be moderated by Nick J. Thorpe from Telum Media. A seasoned writer, copywriter and freelance journalist, Michele Koh Morollo has lived in different cities around the world. Michele is the author of memoir “Rotten Jellybeans”, and has contributed to fiction anthology “Love and Lust in Singapore”, and the annual anthologies of the Hong Kong Writers Circle and Women in Publishing Hong Kong. “Without” is her debut collection of short fiction. A writer and professional rugby player for the city, she lives and breathes Hong Kong and is fascinated by its culture and history. Her parents wanted their children to discover the real Hong Kong and to know its people. Her book is a tribute to that wish. Born in Hong Kong, Jason is a globe-trotter, a full-time lawyer and a freelance writer who raves and rants about Hong Kong and its people. Jason is the bestselling author of “HONG KONG State of Mind”, “No City for Slow Men” and “Umbrellas in Bloom”. Shannon Young is an American author living in Hong Kong. Her books include a coming-of-age travel memoir called “Year of Fire Dragons”, a Kindle Single on Millennial student debt, and two novellas set in Hong Kong. She was the editor of an anthology by expatriate women in Asia called “How Does One Dress to Buy Dragonfruit?”, and she once won a Literary Death Match. William Furniss is an urbanist and architectural photographer based in Hong Kong. Numerous exhibitions have been held of Furniss’ work which features in collections in Hong Kong and elsewhere. He teamed up with the Sovereign Art Foundation for “Queen’s Road West”.